Copenhagen is a safe and friendly place with world-class amenities. Visitors travelling with children in Copenhagen will find an abundance of fantastic and exciting attractions geared towards kids, making this a wonderful city for the whole family to enjoy. A trip to Copenhagen must include a visit to Tivoli Gardens, which boasts beautiful miniature gardens, a theme park with arcade games and rides, and even open air stages where plays and concerts take place. 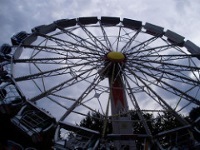 The Bakken Amusement Park is great for warm days and is the oldest of its kind in the world, having opened in 1583. The Nature Playground, located at Valbyparken, is also a must for a day out in the sunshine and fresh air, and a good place for a picnic. There are numerous parks and green areas in Copenhagen where families can play and relax. On colder days when outdoor activities with kids aren't an option, head off to the Denmark Aquarium, the wonderful Copenhagen Zoo, or the Mystic Exploratorie, a fantastic place where kids are equally thrilled and perplexed. For toddlers, the Kompan indoor playground is a wonderland of slides, balls, and bright colours. Children will also enjoy some of the more traditional sightseeing attractions which delight young imaginations, like the palaces and castles.